For applications requiring the maximum video real estate that stores in the smallest space possible the RFT2-3LH-24-D-DP is ideal. Originally designed for outdoor transit case applications the RFT2-3LH-24-D-DP features three 24” LCD panels with 1920x1080 FHD resolution and wide -20C to +70C operating temperature to ensure reliable operation under a broad range of environmental conditions. The LCDs feature wide, 179-degree symmetrical viewing cones to provide excellent visibility and image fidelity from any viewing position. 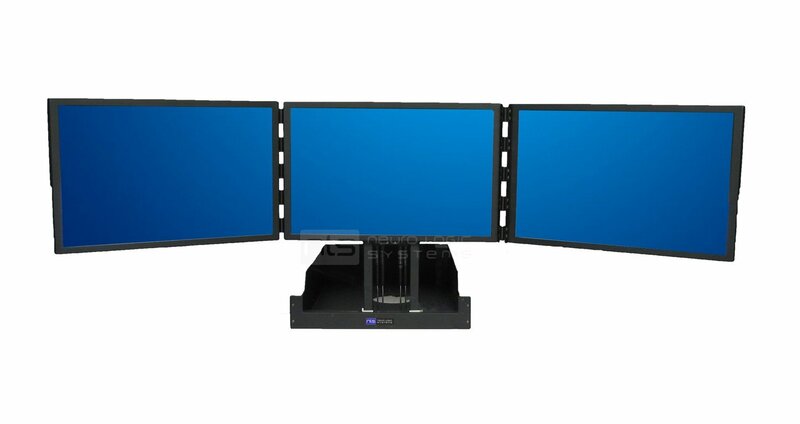 Independent support for VGA, DVI and Display Port video is provided for each of the three LCDs. An optional touchscreen is available on the center LCD. The RFT2-3LH-24-D-DP accepts 90-264, 50-400Hz Power.